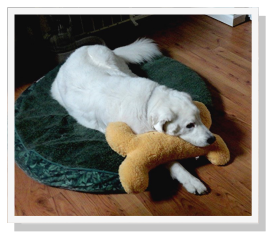 Gus: A Therapy Dog | Kuvasz Fanciers of America, Inc.
Gus doing his therapy work with an autistic boy who was terrified of dogs. Gus & Vicki worked with the boy for 2 years. Initially, he would hide in his bedroom, piling furniture against the door, when Gus got out of the car. Slowly, the boy began holding Gus’ leash, petting him, touching his muzzle, kissing him on the head, and helping Vicki lift Gus into her car. 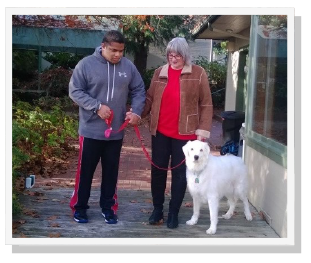 Gus retired from his therapy work at the age of 12.5 because of a neurological condition that has affected his mobility. Gentle Gus helped many children over the years. 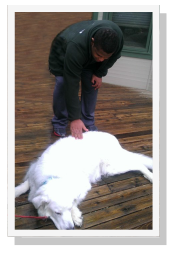 Gus is also the Recreation Director for Vicki’s dog boarding business, Animals Reign. He welcomes all dogs and cats and will rise to the occasion for a playful pup or just hang out quietly with the more sedate visitors.